The GAL, The Mirror and The Soul of Japan, a photo by timtak on Flickr. The above image is from the cover of Koakuma Ageha (Little Devil Ageha), a fashion magazine for young Japanese women. It shows a certain style of Japanese woman ,or GAL, taking off a mask which is wearing blue contact lenses, white foundation, and red lipstick, to reveal an even more beautiful (so it is suggested) winking GAL. Adjacent is the caption "This is how everyone creates fake faces," the title of an article on how to avoid being fake. I have a brief documentary video on Youtube which talks despairingly about the Japanese practice of using glue on their eyes to create "double eyelids" (I call it a "crease") as a result in part of Western influence. Many viewers respond that they do not double their eye lids to look Western. I have gradually become more and more in agreement with my critics. At the very least, the Japanese GAL has surpassed fakery and Western immitation. The GAL has been influenced by the West, but in true Japanese cultural style, GAL beauty has taken in Western facial aesthetics, mixed this with Japanese sense of facial beauty to create something - to the Japanese at least - better, more beautiful. This story regarding the creative power of Japanese culture to take in the influence of others cultures, to mix it up and harmonise it with the Japanese sense of taste is to be found in a great many commentaries regarding Japanese culture. And it is not (just) hard cheese. Sure it does have to be admitted that the Japanese Culture owes a very great deal to Chinese culture, and more recently to Western culture. The Japanese are acutely aware of this. But they are right to point out that they are great at improving on things, to create something new, something that themselves at least like better. The GAL has done it again. How do the Japanese achieve this assimilation-and-improvement ability? One of the best renditions of this theory is to be found in Watsuji's Climaticity (Fuudo) theory, which holds that the Japanese environment and climate was such that it did not create a division between humans and the environment but encouraged their unity. Further, this theory of the unity of the environment the human, of the world and self, finds it is best expression in Kitarou Nishida. Nishda argues that if you perform phenomenological bracketing, that is to say if you remove all interpretation of your environment, if you silence your (annoying) inner voice, then you reach pure experience, and experience which is contradictorily, both self and the world. Nishida generally used visual metaphor and drew pictures of circles on his blackboard at Kyoto University. I find it explanatory to consider Ernst Mach's "visual field". The visual field is generally considered to be view (a bounded opening onto something bigger), or at best a viel, but Mach, and Nishida, considered it to be the very stuff of the world and self. The ability to identify with this mirror itself rather than any characteristic reflected in it, or abstract explanation of it, allows the Japanese to be almost infinitely malleable, almost infinitely good at assimilating. This does not mean that want to become Westerners. They taken in Western looks because they are also Western looks. And they stop taking in when they like what they see, because what they see, is themselves. ---日本文化は、主体即環境、人間即自然として、自己同一的に発展したものということができ、東西文化の結合を日本に求めることができる (and we know where he got that from, down the corridoor in Kyoto University). My Students Wouldn't Recognised Me, a photo by timtak on Flickr. 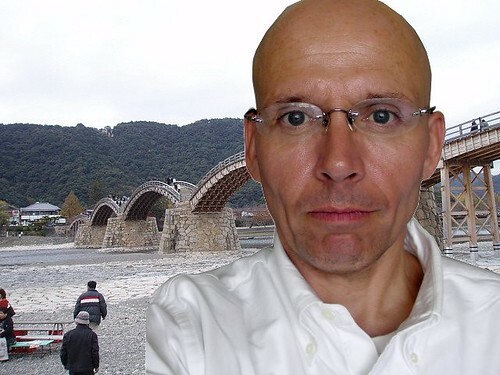 If you met me in Iwakuni, next to the famous kintaikyou bridge shown in the background, would you recognise me? Of course not if you don't know me from Adam. My Japanese students might not recognise me either, because even though they know me, they store intormation contextually, complete with the context in which it originally appeared: their classroom in Yamaguchi University as opposed to Kitaikyou Bridge in Iwakuni City. Masuda and Nisbette (2001) demonstrated that Japanese were more likely than Americans to forget target objects (fish and animals) if the background in which they were presented were changed. This difference may also be produced by a tendency for Japanese to store information visually, as opposed to linguistically, in accordance with the theory in this burogu, but I have no data to support this assertion. Image adapted from the generously licenced 錦帯橋 by Chicatan for a lecture on Masuda and Nisbett's tremendously interesting research (Nisbett, 2004; 増田, 2010; リチャード・E・ニスベット, 2004). 増田貴彦. (2010). ボスだけを見る欧米人 みんなの顔まで見る日本人. 講談社.リチャード・E・ニスベット. (2004). 木を見る西洋人 森を見る東洋人思考の違いはいかにして生まれるか. ダイヤモンド社. How is it that the Japanese are able to see themselves? Why does Kyari Pamyu Pamyu have eyeballs on her dress and why does her mental self spew them out. Why do these same eyeballs encircle her her corporeal body? Why is her dance so choreographed? Why does she move from one pose to the next, in a triptych of recognisable poses or kata? And why do Japanese martial artists, such as Karate and Judo practitioners, or sumo wrestlers, stand in rows and make the same poses, or kata over and over again? Why are all Japanese path (michi or dou) practitioners, from martial artists to tea-ceremony aficionados and Noh actors, so keen on repeating one set forms, kata, over an over again? Are they clones? Are they unable to move freely, fluidly? What is the importance of repeating set actions over and over again, and does this have anything to do with Kyari Pamyu Pamyu's eyeballs? George Herbert Mead argues that it is impossible to have a visual self unless one is an actor (with an audience to react) or unless one has a mirror. Generally speaking visual self representation are for others. Conversely it is only language, the logos, that allows ourselves to take the perspective of others, and create a generalised --other independent-- perspective of self. Language, mead says, is special in that it provides a mirror, because when transmitting a language, even to oneself, the word as stimulus can be understood from the perspective of others. Derrida argues that the defining characteristic of language, and indeed any sign, is that it can be repeated. If I write a random squiggle on a page, that is not a sign. As soon as it is recognisable, and I or someone else, even in my my absence, can repeat it then the squiggle becomes a sign. Iterability is defining characteristic of signs. In "Bodies that Matter" Judith Butler extends Derrida's observation to iterable bodily movements. Iterable bodily movements such as gestures, poses, and presumably the iterated movements - kata- of Japanese practitioners, are signs. Repeating and repeated acts allow the body to make signs. Martial artists perform an embodied narrative. Returning to Mead, looking carefully he does admit that gestures, are also language. And these allow their performers to understand their acts as if from the perspective of others. Iterated and Iterable bodily movements, allow us to see the same from the perspective of others. The movements of the body become a language, a language that demands the eye of the Other. Japanese martial art practitioners, all Japanese path practitioners, and Kyari Pamyu Pamyu, repeat set actions, practice their embodied language, and their bodies come to matter. Their bodies speak. They come to be able to see their bodies from the point of view of the other. They become able to have an objective view of self, and thus to have a visual self. Practising the kata of the martial arts, and all other Japanese ways, the practitioner becomes able to see his body from a view apart (riken no ken), to have eyeballs inside her self that yet surround and are able to view her. Image on right: adapted from Karate Practice by Robert Couse-Baker. Image on Left, Kyari Pamyu Pamyu singing Pon Pon Pon copyright Kyari Pamyu Pamyu (きゃりーぱみゅぱみゅ) the director Jun Tajima, Masuda Sebastianone, and Warner Music Japan. Thanks to Ryosuke Matsumoto for emphasising the importance of Kyari Pamyu Pamyu, Professor Masamune for reminding me of Judith Butler, Tatsuya Hara for being a great interlocutor, and to Holy Whopper for encouraging me to keep writing. Pachinko, The Mandala and Roulette, a photo by timtak on Flickr. The biggest contradiction facing the gambler is the obvious fact -- bearing in mind the luxury of gambling establishments -- that the house on average wins. In her seminal paper on gambling, Langer (1978) argues that gamblers have an "illusion of control". They believe that they can beat the odds, and come out above average. If they did not have some sort of illusion then they would not even enter the casino or pachinko hall in the first place. 1) The essential illusion that "I am not an average player. I can beat the odds." 2) That one has a method of beating the odds. 2.1) The illusion that one can make superior choices. 2.2) The illusion that one can persevere more, rely on ones konjo. To relate this cultural difference to the overall message of this blog (Nacalianism), I argue that we westerners have illusions about our linguistic thoughts to ourselves, our self-narrative, our 'hearing ourselves speak' (Derrida, 1976). When Westerners think that their choices are better than average, that they can "choose" better numbers on the roulette wheel, they are betting on their internal voice: "This time it is going to be a six," "This time it is going to come up red." "Choice" and verbalisation are, I believe, inextricably linked. Choice is an act of meaning (Stevens, Markus, & Townsend, 2007). Westerners gamblers believe that their words will express the world. The Japanese do not have any unrealistic expectations about their self-narrative but they do have a similar illusion about what they see and imagine. Japanese style perseverance is seeing a task through to the end. As they look at the pachinko machine, and merge with it as if looking at a Mandala (top right) they think that their imagines and expectations will come true. The Western linguistic gambler ignores the sights that he sees, and holds onto the notion that his words will come true. The imaginative gambler ignores the linguistic notions of odds but believes that his visualisation will come true. He negates the linguistic self. He becomes one with with the pachinko machine, and believes that his view will conform to his imagination. Pachinko machines resemble Buddhist mandalas (top left). They invite the player to realise that the visual world and the self are contradictorily the same (Nishida: see Heisig, 2004). Roulette tables invite the player to think that the linguistic (34, 33, even) outcomes are the same as the linguistic pronouncements in the mind. Top left:Tawang Monastery Doorway Mandala by D Momaya. Creative Commons, share alike. Bottom:A Nightcap by priskiller. Creative Commons, share alike. Derrida, J. (1976). Of Grammatology, trans. Gayatri Chakravorty Spivak. Baltimore. Langer, E. J. (1975). The illusion of control. Journal of personality and social psychology, 32(2), 311. Stephens, N. M., Markus, H. R., & Townsend, S. S. (2007). Choice as an act of meaning: the case of social class. Journal of Personality and Social Psychology; Journal of Personality and Social Psychology, 93(5), 814. The object above top is a Japanese scrubbing brush (kame no ko tawashi™, turtle child bundle, or tawashi for short) . Tawashi are used especially for scrubbing wooden vessels such as barrels, that might otherwise be damaged by more aggressive scrubbing techniques. It is almost completely organic being made of hemp palm threaded into a twisted loop of wire. Most Japanese households have one somewhere. Tawashi are given as consolation or booby prizes (at least in the popular long-running Asahi Television program "Welcome Newly-weds,"新婚さんいらっしゃい) in the same manner as wooden spoons are given to losers in the UK. Both the tawashi and the wooden spoon are the almost useless item, that everyone almost wants. A tawashi is the sort of item that, like a wooden spoon, one wants but one has, and there is little use in having more than one at home. 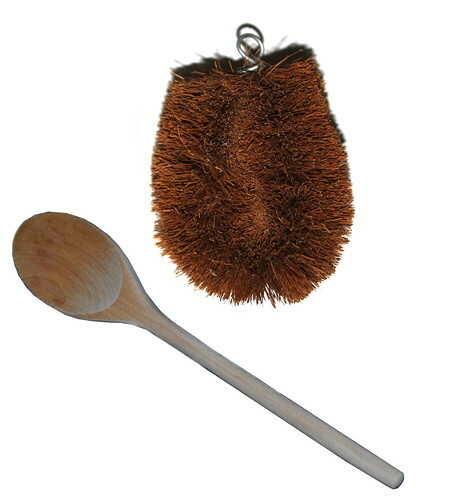 In accordance with the Nacalian theory presented by this blog, I suggest that that the wooden spoon is phallic whereas the tawashi may be yonic, and thus each may represent: the hidden but ubiquitous, wanted and yet unwanted, ambivalent part of Western and Japanese culture. Look at the tawashi and the wooden spoon and tell me I am wrong. Cake Tasting Originally uploaded by timtak. I realised too late that this experimenta was a FAIL - my fault - since the scale was reversed, with "1" meaning most applicable and 5 meaning least applicable. Hence the Japanese in fact believe that they purchase food after tasting it due to information they receive from tasting the food regarding its taste and freshness. It seems to me that this is not true, but that is what the data proved to be the subjects own perception. The following is therefore incorrect. Many such souvenir shops and department stores allow the customers to taste the wares, from rice cakes to cured ham and sometimes wine. I think that if shops in the UK were similarly generous then the homeless, hungry and otherwise desiring would eat the proprietors into bankruptcy. 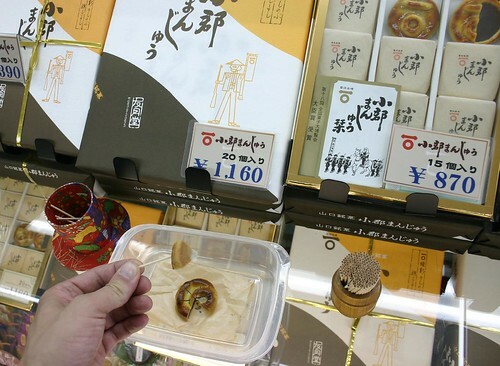 But in Japan, the land of "giri" or "obligation," those that taste often feel obliged to buy. Indeed supermarkets often employ ladies to push sausage nibbles upon their customers safe in the knowledge that the latter would feel to obliged to stand their with their mouth open. This year (2012) one of my seminar students investigated the uniquely Japanese (or at least non-Western) sales technique, to see if providing product samples is merely a tasting (providing information) or a way of improving seller-customer relationships and instilling an obligation (giri) to buy. 1) The needed or obtained information about the product. 2) They felt the shop assistant to be attractive. 3) They felt obligation (giri) towards the shop assistant as a result of being allowed to taste the product. On a scale of 1 to 5, the results were as shown in the graph below. It was found that both shop assistant attractiveness and obligation (giri 義理） were very significantly greater (p less than 0.001) than the importance of having gained information to the purchase decision. This suggests, as argued by previous research, Japanese emphasise human relationships, especially exchange relationship, over product comparisons. This "sales by promoting obligation technique" is a new sales technique to go alongside "door in the face", and perhaps to replace "foot in the door" which may not work on Japanese because they may be less likely to want to maintain a self-consistently positive self concept. Higashiyama, S. (2012) Title to be decided. Unpublished graduation thesis, Department of Tourism Policy, Faculty of Economics, Yamaguchi University. The Japanese Today, a photo by timtak on Flickr. 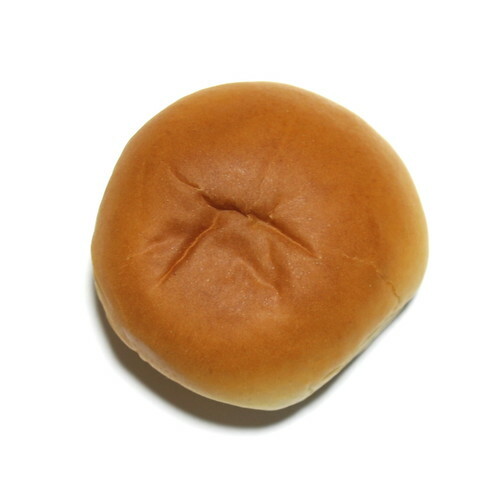 The above may look like a bun, but in fact it is a bean bread bun, containing sweet bean paste. There is considerable research to suggest that many East Asians, at least from Hong Kong (e.g. Morris and Peng, 1994 or Norasakkunkit and Uchida, 2011a for a review on Japan) are bi-cultural in that they retain Asian culture while having been influenced by Western culture. To my mind the Westernisation of the Japanese remains fairly superficial, in that while Japanese, especially young Japanese, now have bleached hair, double eyelids and avow Western values, such as autonomy and choice, they are "eggs", or my neoligism bean-bread-men: white on the outside but still thoroughly Japanese underneath. An "egg," is a "racial slur" referring to a while male that has Japanised his heart partly in order to date Japanese women. In that sense I am attempting to be an egg. I am definitely white on the outside. I am not sure if I have succeeded 'yellowing' my heart. The bean bread is made of an outsider layer of bread (often associated with Western society) coating a heart of sweet brown bean paste - a Japanese delicacy that is rather alien, not to say disgusting, to many Westerners. I love it. Like the egg, it is white on the outside, but the centre is the meaning, the truth, and raison d'etre of the brean bread bun. I think to an extent many Japanese have become superficially Westernised, like bean bread buns. I do not see this as being a slur. The ability to incorporate, innovate, and create a hybrid - such as the bean bread bun - is famed facet of Japanese cultural evolution. I worry though. It seems to me that bread and sweet bean paste don't mix. Furthermore it seems that some Japanese are becoming melon bread, a sort of soggy sweet bread with none of the important Japanese filling, or gumption, underneath. In some important research by Norasakkunkit and Uchida (2011b) it was found that while non-marginalised Japanese youth in higher education showed the Japanese pattern of persevering more under critical conditions than under praise (Heine et al., 2001), the marginalised (NEET) youths needed -- like young Americans but possibly not as successfully American as young Americans -- needed to be praised. The ability to take criticism, be grateful, be motivated and see criticism as a path to self improvement is perhaps the strongest and best part of the Japanese heart. Bean bread buns - and bean bread men - banzai! Heine, Steven J., et al. "Divergent consequences of success and failure in japan and north america: an investigation of self-improving motivations and malleable selves." Journal of personality and social psychology 81.4 (2001): 599. Morris, M. W., & Peng, K. (1994). Culture and cause: American and Chinese attributions for social and physical events. Journal of Personality and Social psychology, 67(6), 949. Norasakkunkit, V., & Uchida, Y. (2011) Marginalized Japanese Youth in Post-Industrial Japan: Motivational Patterns, Self-Perceptions, and the Structural Foundations of Shifting Values. Norasakkunkit, V., & Uchida, Y. (2011b). Psychological consequences of postindustrial anomie on self and motivation among Japanese youth. Journal of Social Issues, 67(4), 774-786. The Japanese do not identify with linguistic meaning -- which is just mere fluff (rikutsu, 理屈, herikutsu, 屁理屈 or "fart spiel") -- but with that which they can hear, see or imagine. The people in this video are doing just that. A politician is driving through the streets of a Japanese town, blaring out his "message" beseeching the local inhabitants to vote for him. But he has no message. All he is saying is, "I am trying hard". "Thank you!" "Thank you!" And even though he is sound-polluting the air, even though he has nothing to say, in a very loud way, his supporter thanks him and expresses her support. This politicians words are phatic; they mean almost nothing at all. The politician has no policies, no message, nothing linguistic that might differentiate him from his competitors. The important thing, to his Japanese supporters is that he is out there on the streets, that he can be seen, heard, experienced there giving his all, till his voice runs horse. What kind of politician is this man? His supporters and detractors, his constituents, are not provided with anything, in words, that might help them choose this man over any other. But the punters do not object (as I once objected, quite vehemently) to his sound pollution because the important thing is this, his act. He is demonstrating his concern. He is there for everyone to see and hear (but not linguistically understand). He demonstrates that his able and willing to shout till his voice is horse. He is thus a man who tries. Like pachinko players, this politician makes no choices, but he perseveres in spades. And it is the demonstrable fact that he perseveres that encourages his constituents vote for him. Perseverance can been seen and imagined. Choices (or words that one says to oneself) can not. And so we are invisible to each other. I say my spiel to my Japanese significant others but they do not hear. They are looking at my enthusiasm, posture, bushy tailed health-iness (genkiness). My theories are invisible and thus, to them, do not exist. I might as well be saying "Thank you, thank you, I will try hard," in the manner of this politician. This attitude is identical to the way in which Westerners fail to see the self expression of Japanese. Generally in my experience Westerners commentators, and many Westernised Japanese, see Japanese politicians as "primitive". There may come a time however that the Japanese come to think that, as I believe, this is just the way that Japanese politics is, due to a different view of the central message mode, and a different view of self. Where we Westerners feel the existence of self - in language, in politician speeches, and even in closed loop tape recordings - the Japanese see mere language. Where the Japanese see self, in people wearing head-bands proclaiming their gratitude, we see something "primitive" or nothing of significance at all. In this way, we are zombies to each other. This politician is fatuous, vacant, mindless to a Westerner. Western politicians with all their rhetoric can seem mindless, vacant to the Japanese. And this can lead to great misunderstanding and even war, to end all wars. This video shows a beautiful Zen Buddhism influenced gravel or karesansui garden. I made a mistake in the video. This garden was not created by the famous artist adopted by this household but an earlier occupant some 300 years ago. Thus the design is as traditional as it gets and not in any way "arty" as I suggested. I have never seen a garden like this that has a rock resembling the crescent moon before, but I can appreciate how the feature could be very attractive especially when the cresent moon rises above the garden. I argue -- and I don't think that I am being controversial or original -- that the heavily Sen influenced gravel gardens, by resembling landscapes (or even celestial bodies) far large than themselves, cause in the mind of the viewer a sort of optical illusion that encourages the viewer to see the scene neither as a garden, nor as the moon or inland see dotted with islands, but as it is in and of itself, as the visual field (Nishida), or the mirror of the sungoddess, the purity of experience (Nishida), completely bracketed (epoche', Husserl) from all interpretation. These gravel gardens therefore encourage a form of enlightenment. Or perhaps watching a Japanese Gravel Garden is a bit like attending a Diwali festival. The following is from the wikipedia article on Diwali. "While Diwali is popularly known as the "festival of lights", the most significant spiritual meaning is "the awareness of the inner light". Central to Hindu philosophy is the assertion that there is something beyond the physical body and mind which is pure, infinite, and eternal, called the Atman. The Face of Pachinko, a photo by timtak on Flickr. As previously argued the "illusion of control" (Langer, 1975) that enables Japanese pachinko gamblers to think that they may win even though the odds are, on average, against them rests in the belief that they have more of those famous Japanese traits: perseverence (ganbari) effort (doryoku), endurance (gaman) (see Heine 2003) and spirit (konjou, see the catch phrase of the second film above) than the players sitting on either side of them. This series of films Pachipro Naniwa Ryouzanpaku 1-6 (1996-1998) stars Hiroyuki Watanabe playing the leader of a "professional" pachinko playing group. A gambling group by this name really existed. The name comes from a Chinese legend meaning a place where skilled, aficionado outlaws congregate. The Hole in the Wall meets Fu Man Chu. Essentially all that Mr. Watanabe's character does is shoot little balls up into a hole. As you can see from his expression, however, Watanabe's character has true grit, guts, or balls, and can put them all out on the table and play to very last one. The film series also builds on a group motif. The pachinko professionals fight as a team. I would not be surprised if those that are addicted to pachinko believe that they have the uncommon ability, uncommon konjo, to lay it all on the line for those they love, even as they waste their family finances pumping the pachinko machine. The type of control that pachinko players hold the illusion of having, is almost as Morling (Morling, 2000; Morling & Epstein, 1997; Morling & Evered, 2006, 2007; Morling & Fiske, 1999) describes. Rather than actively changing their environment, the Japanese change or even rather negate the self, but throught doing so they wait out the storm and come through on the other side as, they delude themselves, winners. I think that the Japanese may be engaging in true-grit-ism (konjoushugi, 根性主義; Yamagishi, 1979) a method of achieving external outcomes through self-control, rather than self-control for its own sake or harmony. No matter how much it may seem that Japanese aerobics is harmoniously self-controlling, it also achieves its stated environmental objective (Morling, 2000) of loosing weight. From the pachinko hall to the sumo stables (heya) and judo club (dojo) one can see Japanese engagining in collective self-denial, but I think that in all cases they have their eyes on the prize. Japanese self negation is not just collectivism, but a means to a personal end. In any event, I hypothesise that gambling and problem gambling among Japanese will therefore correlate more with true-grit-ism (konjoushugi, 根性主義; Yamagishi, 1979) than illusions of (primary) control, for which scales exist (Moore & Ohtsuka, 1999; Raylu & Oei, 2004). Possible Items for a True-Grit-ism（根性主義） scale taken from Yamagishi's paper (1979) above (English translations and some revision to the original Japanese are mine). In order to achieve ones goals abstinence -- being able to achieve a victory over oneself -- is the most important thing. In order to achieve your goals, endurance and mental strenght are important. You will achieve your goals if you carry out your duties with endurance, the power to continue, and a spirit of self-sacrifice. If you endure and toil you can achieve happiness. In order to be happy you need to have a strong spirit. One can grow as a person by persisting - doing the same thing over and over again. 自己犠牲の精神を発揮することにより人間形成がなされる｡ One can grow a person through the application of the spirit of self-sacrifice. The most important strength to have is strength of sprit: the strenght to defeat ones desire, and achieve victory even over oneself. You can win an olympic goald medal through strength of mind. Under Langer's formulation those that have "an illusion of control" are those that suffer from the illusion that there is an easy way, a free lunch, a short cut to riches, that gamble. I suggest that in Japan it is precisely the opposite sort of people - those that believe that perseverence can get you anywhere - who end up in front of the pachinko machine. In that sense pachinko hits the best of us. I think that something should be done. Morling, B., & Epstein, S. (1997). Compromises produced by the dialectic between self-verification and self-enhancement. Journal of Personality and Social Psychology, 73(6), 1268. Morling, B., & Evered, S. (2006). Secondary control reviewed and defined. Psychological Bulletin, 132(2), 269. Morling, B., & Evered, S. (2007). The construct formerly known as secondary control: Reply to Skinner (2007). Morling, B., & Fiske, S. T. (1999). Defining and measuring harmony control. Journal of Research in Personality, 33(4), 379–414. The effect of social support on Americans and Japanese, adapted from Uchida, et al. 2008 on Flickr. Uchida et. al. (2008) found that receiving emotional support, such as from a close friend, had less postive effects on Americans than Japanese, since the former wanted to see themselves as independent, while the latter know that they can never be. I like this paper and consider it relevant to those in the hospitality industry. When I first came to Japan, being a Westerner of low self-esteem, I did not like the way that Japanese hospitality providers would provide me with English language menus, forks or disposable chopsticks, since I felt that their kindness was saying, "you can't read Japanese," "you can't use ordinary chopsticks." I felt their kindness was an attack upon my self-esteem and independence. So, beware of helping Westerners. Some of them, are hinekureteiru or twisted. At the same time, if the Japanese tendency to try to help prior to any demand (sasshi) is explained first, Japanese style hospitality, such as that provided by traditional inns (ryokan) providing luxury but choice-less food (kaiseki) with mothering helpers (nakai) can be a very rich cultural experience. The Chrysanthemum and the Bits of Wire, a photo by timtak on Flickr. 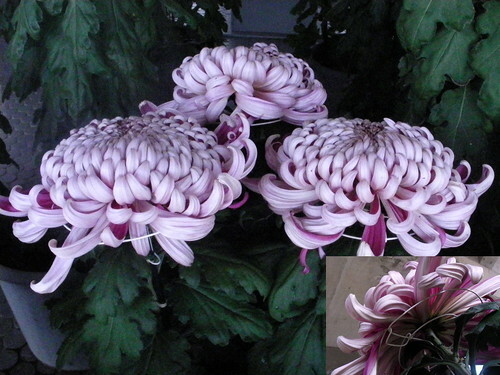 The idea for the title of Ruth Benedicts eternally famous book about Japan, "The Chrystanthemum and the Sword" may have been (see Lummis, 2007) these pieces of wire that hold up the chrysanthemums typically displayed at Japanese autumn flower festivals (see insert bottom right). Benedict appeared to have believed that in addition to a love of nature, naturalness and hence freedom, the Japanese were oppressed by a confusian iron rule, a heirarchy brought, about by the Sword. The bits of wire are the swords that holds natural Japan in place. I argue that the Japanese are held in place not by the sword, or the bits of wire under these flowers, but by the beauty of the flowers on top. The Japanese love beauty, and desire to keep producing beautiful flowers, a beautiful people, and a beautiful country. It is in Japan as it is the USA. Society is held together by love, starting with self-love. It is just that visual beauty is of less importance than "good" narratives in the USA. Benedict, R. (2006). The Chrysanthemum and the Sword (1st ed.). Mariner Books. Cultures Consequences, a photo by timtak on Flickr. It is so thick and so expensive that perhaps few people read Hofestede's incredibly famous "Culture's Consequences" (Hofsteded, 1980). This post is a repeat. If you do read Culture's Consequences you will find that Hofestede's "Masculinity" factor, in which Japan came out way on top is defined in the same way as, and contains questionnaire items entirely applicable to Markus and Kitayama's (1991) Independent Self Construals, that is argued to be typical of Americans! E.g. "How important is it for you to work with people that cooperate well with one another?" or "How important is it for you to have a good working relationship with your manager?" are both items that correspond to femininity, that Japanese rated as being unimportant. Markus and Hofesteded to agree however, that Independence is a masculine trait. Before she teamed up with Kitayama, Markus (Markus and Cross, 1990) wrote a very similar paper about the differences between men and women, even using most of the same data (such as Cousin's study) to support the assertion that there are two types of self construal, held by men and women. Personally I think that Markus is right on both counts, about the Japanese and about women. How could Hofstede get Japan so wrong? I guess it was because he was surveying Japanese IBM employees. Or is it because Japanese really are by far the most independent culture in the world? In any event Hofsteded did a good job of spinning his surprising findings. I admire all the people mentioned in this blog post. Hofstede, G. (1980). Culture’s Consequences: Comparing Values, Behaviors, Institutions and Organizations Across Nations (2nd ed.). Sage Publications, Inc.
Heejung Kim vs Japanese Architects and Designers, a photo by timtak on Flickr. I claim that the Japanese self is expressed visually in "the mirror in their head" (Heine et al., 2008) . Thus while Japanese linguistic self-expressions tend to be humble, their visual self-expressions in their autophotoraphy (Leuers & Sonoda, 1999; see Heine, 2007, p.213), archictecture (photo above), clothing both modern and traditional (photo above), and their zany products (photo above, bottom; bottom right copyright Kawakami, 2000). However, one of my favourite cultural psychologists, Hejung Kim (Kim and Markus, 1999; Kim and Sherman, 2008) had demonstrated that Asians Americans have less of a preference for unque figures than European Americans. She had Asian and European americans evaluate the 9 parts of each of the digrams in the top of the above photo (Kim and Sherman, 2008, Kim and Markus, 1999) and found that the European Americans were more likely to choose the unique parts (M = 5.36, SD = 2.12) than the Asian Americans (Mean = 4.39, SD = 2.17). Why is this? Were there in sufficient Japanese in the Asian sample? Or am I am I wrong; Harajuku fashionistas, and product innovators are not-represtentative of Japan. I think that Japanese self presentation is not only visual, but as such, aesthetic. Just as Americans do not strive to be linguistically unique in naff ways, the Japanese don't choose clothes and products just because they are unique, but also because they look good. Conversely, American visual expressions (think of their bodies!) and Japanese linguistic expressions (think of traditional Japanese politicians) can be....less appealing. The difference is in which media of self expression is important. Americans believe that appearance is skin deep. Japanese have negative words for language (rikutsu). Both Japanese and Americans admire uniqueness, but it is only in unimportant media of self expresion are people prepared to be naff to achieve uniqueness. The American preference for the sole isoceles triangle among the array of regular triangles in the diagram top left is just not aesthetic. It does not look nice and the Americans know it but they don't care about looks. The American preference for this irregular triangle is comparable to the anti-conformism found in Takano's experiment in Japan but not America. Japanese were prepared to give an incorrect (linguistic) answer in order to be unique, when all the confederates were saying the right answer, whereas Americans were not. The Japanese wanted uniqueness and did not care about being "right." In a medium that mattered to them, the Americans were not prepared to go that far. I predict that Japanese will prefer the parts that are for instance at the top of the piramid, or centre of a pattern, or which hold an aesthetically privelidged position within the overall form. The Japanese may also demonstrate a preference for figures that are in harmony with the rest of the parts, since in Japan, being unique and yet in harmony are (from the philosophy of interdependence) not contradictory. Indeed the people that we call unique, such as conductors, fashionistas, designers, and architects of know a lot about and produce a lot of things which demonstrate harmony. I am going to repeat the experiment in my class and see which parts of the above diagrams the students prefer. Heine, Steven J. (2007). Cultural Psychology (First ed.). W. W. Norton & Company.